Matthew: This episode is often thought of as a "quintessential" Star Trek story, and it's easy to see why. The overall message is one of tolerance and understanding, and the importance of increasing knowledge over and above aggression as a response to new challenges. There are some very heady sci-fi concepts in this episode, including: silicon based life, a completely "other" intelligence, and reactors being critical for space colony survival and life support. Kevin: This is a great example of something Star Trek, especially TOS, came to do very well. It manages to present what on the surface appears to be a straightforward monster-of-the-week, but layers it with great Star Trek messages and themes. I imagine Rodenberry and crew eventually had to get pretty good at packaging their stories in trappings that would still get the studio on board. Matthew: Some very nice Star Trek sentiments in this story concepts include a stark contrast between the ignorance and prejudice of the miners and the more refined sentiments of the Enterprise crew. Mr. Spock plays the role of the extreme end of the spectrum, hoping that a unique life form can be preserved instead of destroyed. He argues that it would be a "crime against science" to kill the final instance of a species. Kevin: I particularly enjoyed Kirk trying to protect Spock and Spock objecting. Both actors did a great job, and it was a great character moment. Matthew: Eventually, contact is made with the mysterious creature, the Horta, with a mind meld. I'm not a huge fan of the mind meld in this episode, as the writing in it is not particularly good, and I would have preferred a different, less "lazy" form of communication with the creature. They could have stopped after the first attempt, and done more of the "No Kill I" sort of communication. Kevin: I said before, and I'm going to say it again. The mind meld and associated Vulcan skills should always be treated carefully. Giving it too much power not just allows but encourages lazy writing. It essentially becomes magic. It begs the question why it isn't used to solve every problem. Matthew: Some story logic problems for me were: what the heck sort of evolution involves all members of a race dying, and one mother being left in charge of the survival of all the young? That doesn't seem like a very good survival strategy, whether you're based on Carbon or Silicon. 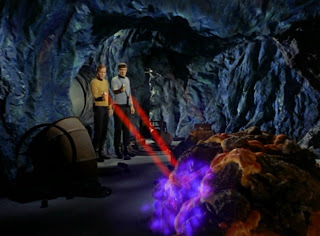 Kirk also has a rather sudden change of heart, from an attitude of "we have to kill it" to "the Horta is gentle, mild." Dude, 50 people have died, including a crew member of yours. And you change your mind for some reason when cornered by the creature? Why didn't the Horta just destroy the reactor pump, instead of sequestering it away somewhere? Indeed, how did it even carry the thing anywhere without dissolving it? Kevin: I agree the reactor sabotage was a little silly, but I don't have as much problem with the biology of the Horta. There are plenty of insect species that send off lone females to foster a new colony, so I can let that go. As far as Kirk's change of heart, I put it in the same column as the somewhat unrealistic treaty in Taste of Armageddon. There's an ALLEGORY at work here, and we make allowances in the story to let it makes it point. Matthew: One small note: we get a classic McCoy line here, in "I'm a Doctor, not a bricklayer!" Matthew: Interesting tidbit - Shatner's dad passed away during filming of this episode. He did all of his dialogue scenes, but scenes in which his back is to camera are mostly his stand-in. Some continuity errors caused by this include a disappearing hand phaser. I found Shatner's performance just fine, excepting his character's sudden shift of motivation. Kevin: I have to say this was one of the few instance of the ubiquitous Federation miner that I liked. Their fear/hatred of the creature is understandable, and unlike other examples ***cough***Mudd's Women***cough*** they actually seem competent professionals. A little overfocused on their jobs, but also understandable given the importance of their work. And the Chief's contrition is believable at the end. It was well played, and it added some depth to a secondary character. Matthew: I love me some Leonard Nimoy, but his mind meld scenes were kind of silly. He didn't elevate the silly dialogue (To be fair, "PAIN!!!" has been a line that has felled the likes of Marina Sirtis, as well). On the other hand, his scenes of arguing for non-violence were pretty good. Kevin: This has always annoyed me, but people in pain, don't scream "PAIN!!!" They just scream. Nimoy just howling would probably have been more effective and quite disturbing. Matthew: I thought the sets were nice, creating a good and believable atmosphere for an underground mining facility. The miners' costumes were predictably colorful and one-piece - they must be made of some super-spectacular-future-material to avoid looking like the miners we see in the present day. Kevin: I thought the caves were very well achieved. I also have to say that the matte depicting the mining complex behind the chief's office is one of my favorites. I like the idea of an entire city structure built underground. Matthew: The Horta looks kind of silly. It has to be said. I understand they didn't have a million bucks per show. But it looks silly. Kevin: I agree the creature itself is pretty silly, especially up close. In HD, you can see chipping paint. But I like the idea of the Horta. The fringe is a fair approximation of cilia. The appearance is evocative, is only partially successfully, of moving, hardening lava. The concept is thoughtful, even if the execution is lacking. Matthew: This is a good episode, that tackles a worthwhile topic in a creative manner. It also isn't terribly heavy-handed in its moral lesson. A few execution problems don't dampen this above-average show. It's an easy 4 in my book. Kevin: I agree with Matt, and am also going to give it a 4. I think what put it over the top for me was the solution Kirk crafts. Instead of being an obstacle, the Horta can be a great asset to the miners. It's a neat solution. Too neat for the real world, but perfectly so for TOS. 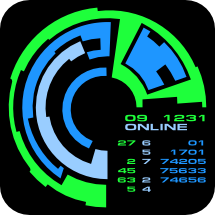 That is a total of 8, certainly justifying its well-remembered place in the series. Are you aware of this remix? Because it might not be good for dancing, but it definitely makes serious use of those two quotes you mention ("Pain!" and "I'm a doctor, not a bricklayer").